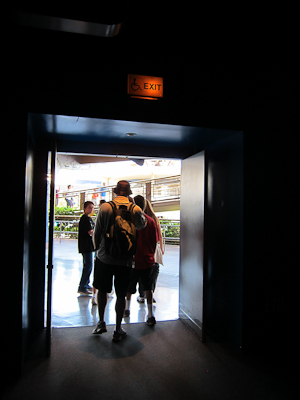 Yesterday I covered the second floor of Innoventions (why the second floor? Because that’s where you go in now) and so today I’m going to cover the first floor. But I do want to put in that Kristin, my friend who caused all the trouble at Soarin’ Over California, lambasted me for saying that I had no interest in seeing Asimo the robot, as he is her son’s favorite character after Mickey. And then Kelli, also of Mothers in the Mouseland fame, jumped on the dogpile to chastise me as well. SO, ladies, I will go in and see the Asimo show, okay? OKAY??? HAPPY NOW??? Anyway, as I was saying yesterday, Innoventions is supposed to introduce us to the wonders of the future, but the unfortunate thing is that the future has changed faster than Innoventions and now the only good thing about it is that it’s air-conditioned (and yes, Kristin and Kelli, Asimo the robot). I think this is the only attraction at Disneyland where it actually says on the sign “Strollers Welcomed.” I mean, strollers are generally tolerated just about everywhere, and also allowed on some attractions, but “welcomed” just seems a little desperate. Wait Time 0 minutes! Strollers welcomed! Everyone welcomed! Just please, please, please come in! Formerly you entered on the first level and waited until the magic doors opened–oh, did I mention that the building rotates? The building rotates. So you formerly waited for the building to rotate to you and joined a group at the magic door until it opened and you met your tour guide. You walked around with a group, which made a fast escape much more difficult. And you were going to get a tour of the House of the Future, which had all kinds of cool things that we could totally expect to find in the distant future, the year 2000. 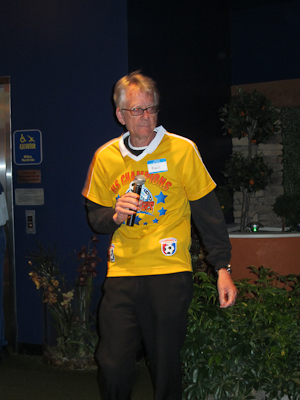 For some reason, the tour guides wear soccer uniforms, like they’re supposed to be kids in this future family or Disney is all hip and into soccer, or maybe they’re trying to woo the non-Americans who call soccer “football.” I don’t know. Anyway, now that you wander to the first floor on your own, the days of the actual tour are gone and instead you just have tour guides who stand around saying things like, “I’m about to give a tour of the house of the future! Come join me!” and very few people do. The cast members are all really nice too, but I’d consider putting in a transfer or something. 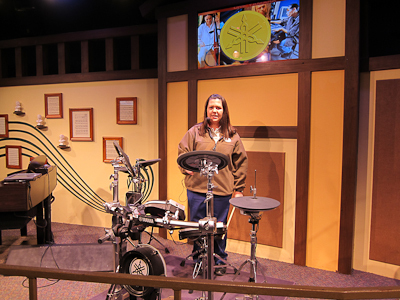 Back in the day, the rotating part had several different segments that your tour group visited. Each had a cast member to explain the segment. 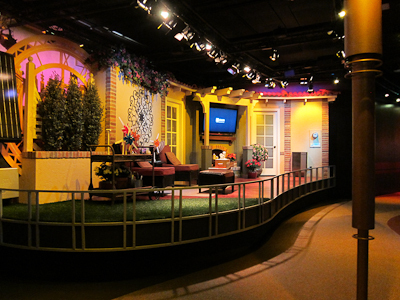 The one time I visited Innoventions prior to the entrance/exit switch, I thought the best segment was the music one. I was the only one there, but she gave her whole spiel with enthusiasm anyway. And I gotta say, kudos to the Innoventions cast members who try really hard and with great attitudes even though the tours aren’t there anymore. You have to respect that, and I do. In all seriousness, I will be the first to praise Disneyland’s cast members. They work so hard and really make the magic–making the experience special enough for me to want to blog about it. Yay cast members! It wouldn’t be such a great park without you. Anyway, the music section has electronic instruments that have all kinds of cool effects, and in the old tour different people (and by people I mean kids) were invited up to sample the instruments. 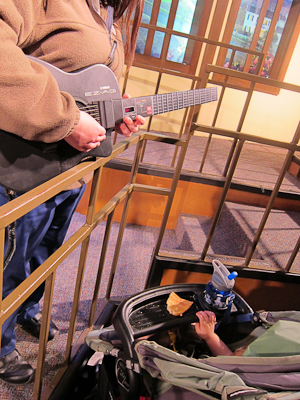 This cast member actually let Theo play the guitar while he was still in the stroller. Talk about above and beyond! Strollers were welcomed, so I wasn't about to take him out. If you own a toddler, you understand why. 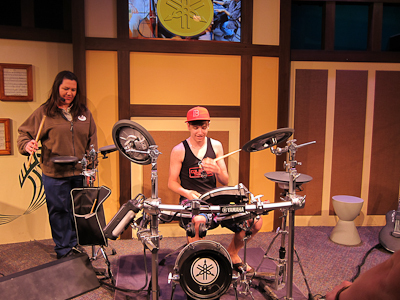 And then there’s always the teenager who just wants to show off, so he says “can’t you program the drums to be exactly like a regular drum set?” and to her immense credit, the cast member does and gives the teen his 2 minutes of fame or whatever. We were still the only ones standing there–us and his two friends. I can play the drums! 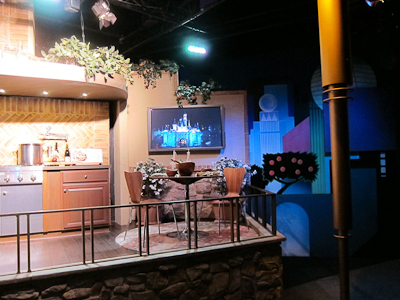 The other segments used to have a cast member explaining what they were all about, but now none of them do except for the futuristic kitchen. This is supposed to be a tv studio or something, I guess. No cast member there. Shiny car. Why is it here? No clue. Apparently in the living room of the future, you're going to have a flat screen tv. NO WAY!!! You will also have a television in your dining room. My mind, she is blown. These three are singing a Queen song. I mistakenly thought that this trio was a family–a dad with two of his kids. I was wrong. The adult was on his own and the kids had established themselves as permanent features. I mean, they could play the game and all, but they were on their third song by the time I left, and really? 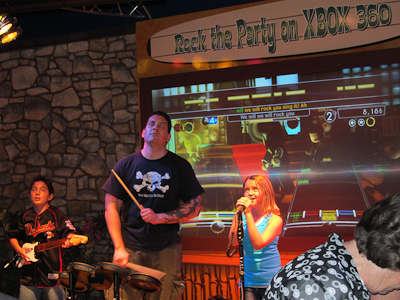 You come to Disneyland to play Rock Band? At least they aren’t High School Musical songs anymore, but if this were my child I’d be dragging them onto Autopia or something and ordering them to have a freakin’ good time because Rock Band is significantly cheaper than this annual pass I bought you, so you better make the best of it. Next, I moved to the house of the future. 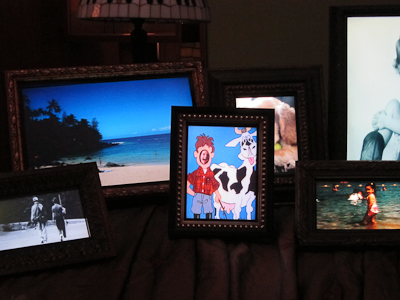 There was a piano (electric, of course), and on top of the piano were these totally cool picture frames that had digital pictures that changed. C'mon, Disney. Nobody's ever going to make these things for 30 bucks. 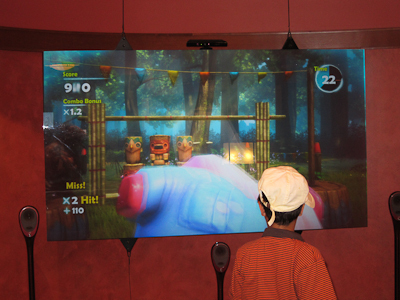 There’s also this amazing video game that you don’t even need a controller for. You just move your body. Wouldn't it be amazing if someone like Sony invented this one day? I did learn, however, that the house of the future is apparently one of the best places to take a nap. 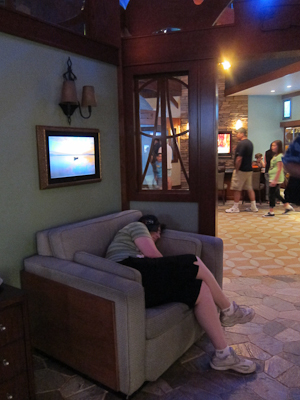 You fall asleep at Disneyland, you end up on someone's blog. Just sayin'. Going into energy saving mode indeed! In the future we will also have coffee tables that have books inside them that you can just flick with your fingers to turn the page. It’s like a Nook, except it’s in your coffee table and it’s also part of the future. For God's sake--use a coaster for that drink!!! Man, that lady in the picture looks like she could go into energy saving mode at any moment. I did like the prototype children’s room. Some kids sleep in a race car bed, others shoot cannons all night. 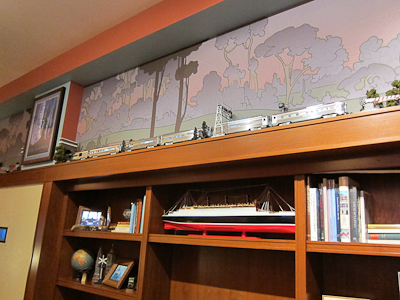 They did have a detail that everyone should have in their homes–a model railroad! 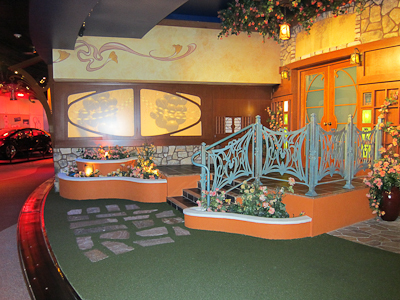 And finally, you wake up from your nap and exit through the former entrance. The weird thing is, you can kill a massive amount of time in Innoventions. We spent a good 45 minutes there and all I was really doing was walking around taking pictures. You could easily spend the whole day in there and not realize it. But at least you wouldn’t be hot. How did Theo like it? Last time I was there, the oldest one was into it, the middle one was totally overwhelmed, and the little one was getting antsy as soon as the doors opened. Innoventions is kinda my fave since it’s pretty unattended, even if the rest of the park is packed. Great pics! Theo could not possibly have cared less. He like the blue though. I know, right? There were two such chairs, and they looked pretty comfortable! You do realize I’m making both of you watch the Asimo show with me, right? Oh my goodness, this one made me laugh. I can’t stand Innoventions. I haven’t willingly set foot in there for like 5 years. 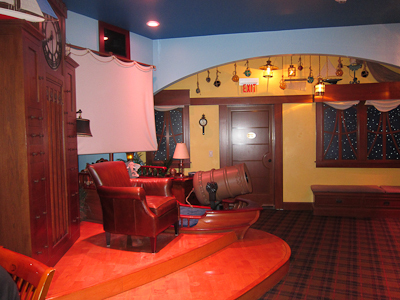 The last time we went the cast member did this whole show where they showed us new and futuristic products, which turned out to include light switches with dimming remotes. Um, I’ve had those in my house for years… The worst of it was that it is sort of like visiting a casino in Las Vegas. You can figure out how to get in, but forget about figuring out how to get out. I felt bad for the cast members too, who were trying so hard. I realize that Disneyland is basically a big commercial that is trying to get me to spend money, and I am happily willing to do so because it is fun. Innoventions just seems to not do as good a job disguising the fact that it is a commercial. It is like a bad informercial. It’s changed from last summer (07/10), when we entered the building, we were “treated” to what amounted to an infomercial about Edison (a power company in So Cal?) 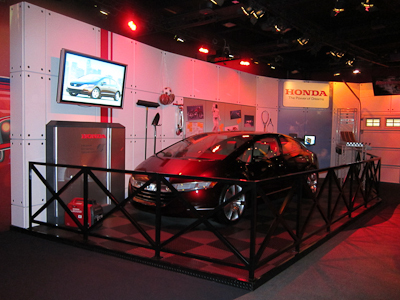 and light bulbs and then meandered to new cars and a bunch of “futuristic” stuff. I’m not sure Asimo was there, if he was, we missed him. Guess we’ll have to go back! Yes, Edison is a power company in Southern California–ironically it’s not even the company that supplies power to Disneyland! Asimo is upstairs. Back in July you would have entered the first floor with the tour and then you could have gone upstairs if you wanted to. Now you enter upstairs where Asimo lives and then can wander down if you want to get out. And what are these “light bulbs” things you’re talking about? Is that some kind of future household item? I’ll never give up my kerosene lanterns and candles!!! Poor sleeping woman–I hope she didn’t have a child with her who ended up wandering off when she dropped off. 🙂 I can’t say that I would be too keen on the “coffee table book”–who wants to bend over and hover over the coffee table while reading a book? Plus, that thing would never fit in my purse. 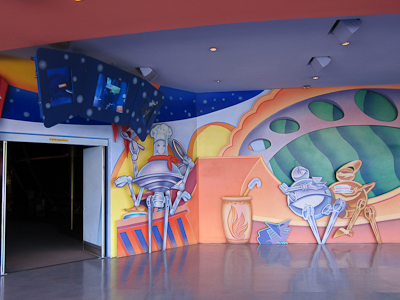 So first off, I would like to thank you for your kind words about the cast members inside innoventions! I am one of those, and it’s nice to know there are guests that appreciate us even though our attraction is sub par. I can’t tell you how hard it is to go there every day and do the things we do knowing that it could be so much better!! Frankly though we as CM’s love it there! Our bonds with each other, and our pride for the place keeps us there. FYI, it’s not a showcase of future tech, it’s the dream home of today! It’s not suppose to be the future….. Even though it’s in “TOMORROWLAND”, and it doesn’t really explain that any where….. So I don’t Blane you at all for not knowing that. 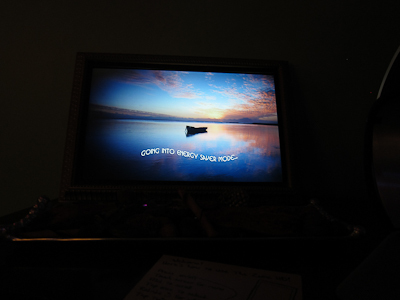 But my hope is you can come back and let us entertain you. There seems to be a lot of things you missed. But in closing. 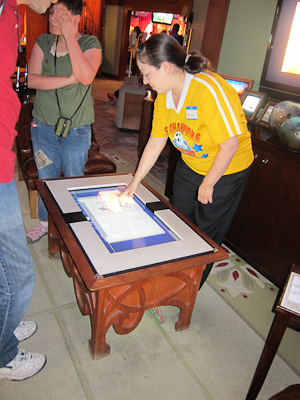 I really appreciate your comments on the CMs at innoventions!! And it is my true goal to give each guest the best I can with what I have!! Yay cast members!!! Dream House of today makes much more sense :). I believe, though, that when it opened back in the late 90’s it was intended to represent the house of the future, or at least that’s what I was told by a CM who worked the attraction at the time. Although if you’ve read some more of this blog, you’ll see that my research skills are pretty lackadaisical and occasionally half-assed :lol:. Thanks for the clarification and for stopping by! I will go back when my AP works again, if only because I’ve been harrassed/shamed into seeing Asimo :lol:. What else would you suggest I take a closer look at? Anything you think would make an interesting blog entry? And why do the house people wear soccer uniforms? 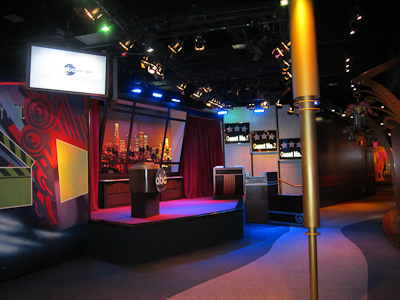 When I went (about a year ago, on a VERY hot day) the TV Studio area was for a TV game show that they did as part of the intro. A CM picked three kids from the audience who each got their own podium and buzzer. (I grew up watching Double Dare so I was excited at this point.) The CM then asked the kids ABC themed questions they would never know the answer to (mostly about Desperate Housewives) and then gave them the answers before the parents had a chance to shout them out. It was horrendous. Why they couldn’t have changed that “ABC” to “Disney Channel” and asked Zach and Cody questions I will never understand. When you were at the mouse-in-law, did you ride Spaceship Earth? I ask because some of the random stuff from Innoventions is also at the Spaceship Earth post-show, though it seems much less out of place there. One thing that is NOT at Epcot is the “what will I look like in the future” thing. Which, strangely enough, is thinly-veiled anti-smoking propaganda. Not that I am pro-smoking, but why do we need that at Disneyland? Two more questions: When you were there, did the building still spin for no reason? And was “Tom-Morrow” still singing with Nathan Lane’s voice? I love Carousel of Progress in Florida and I would have no problem with them tearing down Innoventions and building something similar there again. I’ve read elsewhere that the sponsors aren’t any happier with Innoventions than we are, but Disney has to keep it running until the sponsorships run out. Hm, the ABC piece sounds very odd. It looks like they’ve removed it, or at least it’s been a bit deserted since I’ve been there. We did ride Spaceship Earth, but I don’t recall if we really looked at the post-show stuff very much. The building does still spin, I think just because it can, and Tom-Morrow does still sing in Nathan Lane’s voice but you really don’t hear him since you aren’t taking the tour. I just found your blog and I love it! If I lived in SoCal I would do exactly the same thing! Call me a dork, but I went back to the very beginning and can’t stop reading it, hence it’s August 2012 and I’m reading an entry that’s more than a year old. I personally loved America Sings as a kid and was really bummed when they took it out. I think it was the rotating seats I thought were “so amazing”. 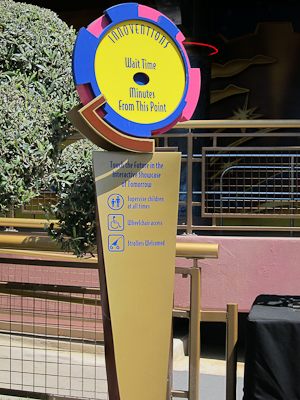 I waited anxiously for what would replace it and was bummed again when Innoventions was the replacement. I did get to see the CoP in WDW, which was cool because it is an original Walt Disney concept and like you I think WDW lacks in many of the authentic touches of Walt himself. Welcome to MYWTM! Thanks for your dedication reading from the beginning :). Rumor has it that Innovations is slated for replacement within the next couple of years. It will be interesting to see what they decide to do with it if that’s true!